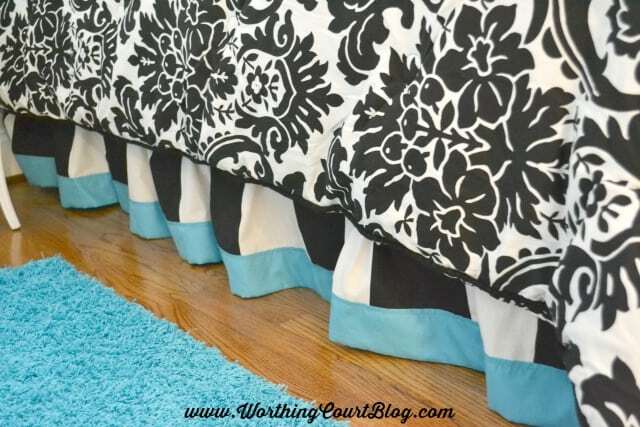 This simple and inexpensive idea will make your ready-made bed skirt look like it was custom made in a designer workroom. If you can sew a straight line, then you can do this! This bedding came as a set that included the bed skirt. It was too long and even though it was a different pattern than the comforter, all that black and white just blended in together. Plus, not very much of the bedskirt shows,so the plain stripes didn’t really add much of anything to the overall look. I needed to come up with a way to customize the bed skirt and make it stand out. My solution was to buy an extra flat sheet, that matches the sheet set for the bed, and use that fabric to make a band for the bedskirt. I knew that I wanted to wind up with a 3″ wide band, so I cut strips of the blue fabric at 12″ wide. It took three strips of fabric to do the entire bed skirt. After joining the three strips of fabric together to make one long strip, I folded it in half and pressed. Now I had a strip of fabric that was 6″ wide. Next, I opened up the folded fabric and folded and pressed each side so that the raw edges of the fabric met in the middle, at the fold line. Lastly, I folded and pressed the fabric back in half which left me with a strip of fabric that was 3″ wide. I “wrapped” the folded strip of fabric around the front and back side of the bedskirt and stitched it in place using matching thread. An easy detail to add that makes a lot of difference. That looks so pretty, Suzy! 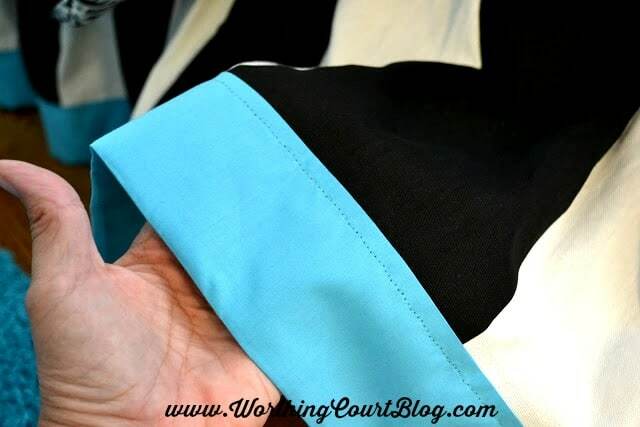 I love the pretty turquoise with the black and white! That is lovely, amazing what a difference a small change can make! That is an amazing difference. Now the bedskirt holds its own and then some with the pretty comforter. Ms M’s room is so cute. She has a talented grandma! I LOVE this room and that skirt is so cute. My Mom has the same bedding:) Thanks Suzy for joining me. It is so nice to see you again. Great idea! Love it. It makes such a difference! I’d love for you to share it at my blog party, Twirl & Take a Bow at http://www.houseontheway.com. It’s every Tuesday. I hope you can stop by! I love this! I’ve been searching for the perfect skirt for my daughter’s bed…I may just have to make it myself! New follower to your blog! Pop over for a visit~I have a great jewelry giveaway running this week! Thanks for joining us at Cowgirl Up this week! I love your new bedskirt, I featured it today on my facebook page. Grab a “I Was Featured Button” from the link party! Looks great! I need to add something to the bedskirt in my oldest daughter’s former room. I put risers on the bed and now the skirt’s too short. Stopping by from Inspiration Friday! It’s a beautiful idea and love the pop of color! Thank you for sharing your charming project at Potpourri Friday at 2805! You are so smart! It is just perfect….huge difference. Thanks for sharing. Such an exciting change up, I have similar bedding to the original in a guest room. When I am ready for something new I will definitely remember this. Thanks for linking up. Looks great! Such a small detail that makes a huge difference. You did a wonderful job on this and I’m sure both mom and daughter love it. OMG aren’t you a smart cookie! I love how it looks! I was trying to figure out why a 12″ piece was needed but now I understand! Awesome job…very designer and it really makes it stand out nicely! This is a great idea! What a big difference this makes. Thanks for sharing your creativity. The band of color makes a huge difference! I love the way you added it- I would have never thought to wrap it around the skirt like that. I probably would have tried to trim the skirt and add the band. Your way is so much smarter and looks much more professinal! We love black and white at our house, but a pop of color it makes the combo that much better. Well done! in the foreseeable future. I want to encourage you continue your great work, have a nice morning!